Over the past few years, educators from junior high school through college have implemented more industry-driven curriculum in hopes of addressing a skills gap plaguing young people entering the workforce. Recently the Mobile Area Education Foundation (MAEF) gave more than 100 high school seniors the chance to take that theory to the next level with a paid summer internship program partnering with dozens of local businesses both large and small. Vital Link 2.0 started when more than 240 local high school students went through an interview process with several local employers. Then, on June 6, those who made the final cut reported to work at locations throughout Mobile County. The program, which is in its first year, worked through the Signature Academies at several Mobile County high schools, and MAEF’s coordinator of branding and fund development, Janelle Finley Adams, said those academies helped identify students who already had a passion for a certain career. One of the employers and sponsors of Vital Link 2.0 has been Austal USA, and in the heat of the past few weeks, 19-year-old Matthew Molette has been developing his welding skills in the shipbuilder’s training center off the Causeway. 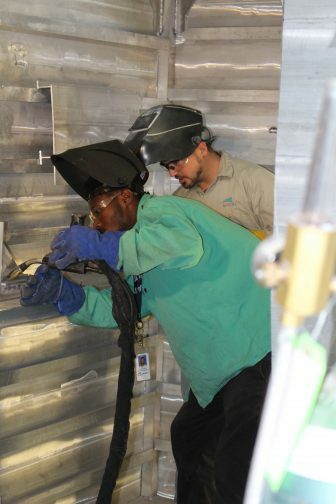 Through Williamson High School’s Maritime Academy, Molette has already gained experience welding steel, but working with the lighter aluminum at Austal has expanded his skill set. Molette transferred to Williamson from New Orleans, Louisiana, last year, and said the welding program there helped him see a different possibility for a career. Austal’s workforce outreach coordinator, Napoleon Bracy Jr., said if Molette does decide to shoot for a job in shipbuilding, he’ll have a significant advantage because of the experience he’s getting now. Though Austal is one of the marquee partners in the program, more than 50 other businesses and public agencies are participating. Shannon Anderson, 17, is already enrolled in the University of Alabama’s early college program at Murphy High School. When she graduates next year, Anderson is hoping to move straight on to Tuscaloosa to finish her degree and pursue a career as a pediatrician. Though it isn’t exactly in the medical field, GulfQuest has had Anderson working with hundreds of children in school groups and on a one-on-one basis during her internship. Her supervisor, Amy Raley, said Anderson has helped the department in several capacities, but added their internship was structured to also help Anderson by developing skills she can use in the future. 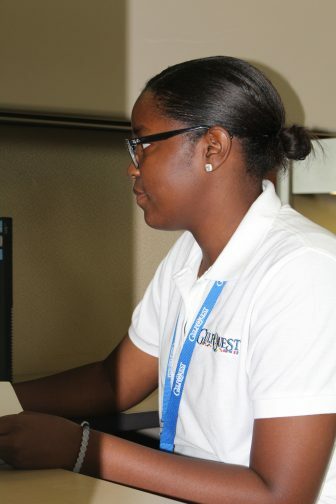 For Anderson, the internship with GulfQuest was her first job, which means it was her first time reporting to an employer and her first time sharing space and responsibility with coworkers. According to Adams, that type of experience is important but can be hard to get outside of the working environment. She said it’s important to have those types of soft skills, and said students actually give them an opportunity to sink in when they’re interested in what they’re doing, especially if they already have an interest in a specific field.